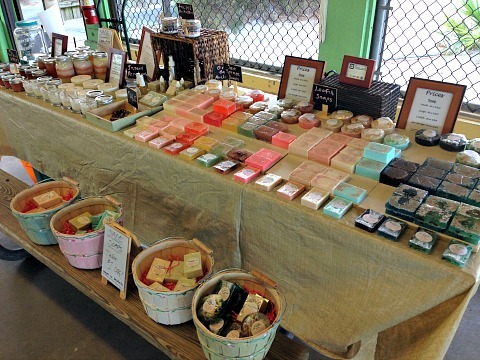 One thing I've always loved is nice soaps, along with body lotions, scrubs, and fragrances. 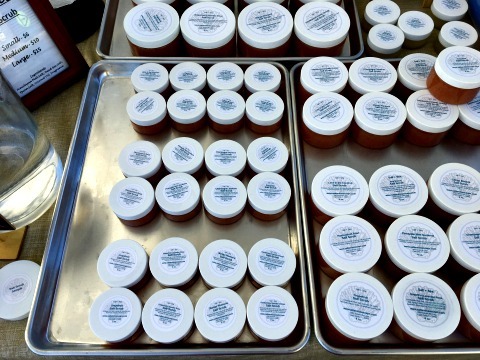 I've been experimenting with the types of ingredients you'd find here in Florida and making my own beauty products. I'm enjoying it so much, I've decided to sell them! 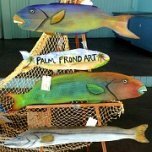 I sell my products at the 2 Cape Coral Farmers Markets during season from October - May, on Tuesdays from 1-6 and Saturdays from 8-1. You can also Contact Me to order or request information. 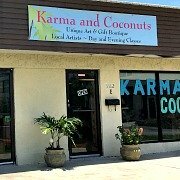 Imagine nice coconut oil soaps made with pink salts to exfoliate and cleanse with lovely smelling tropical scents, or body butters made from mango and avocado butters, and scrubs with salt from the sea ..... or facial masks made from clay and seaweed that cleanse, moisturize and detox your skin. My sea salt soaps are made with: Coconut Oil, Palm Oil, Safflower Oil, Glycerin (kosher, of vegetable origin), Aqua/Water/Eau, Sodium Hydroxide (saponifying agent), Sorbitol (moisturizer), Sorbitan oleate (emulsifier), Oat protein (conditioner), Himalayan Pink Salt, Mica, and fragrance. 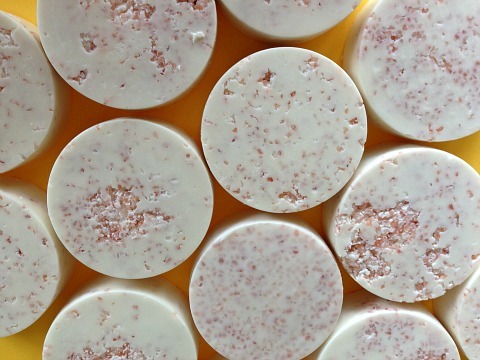 Titanium Dioxide is added to the white-based soaps. Soap has a long shelf life, it doesn't really have an expiration date because the ph of soap is alkaline enough to keep germs and mold at bay. I love using pink salt because of it's so pretty, it gives a mild exfoliation, minerals in the salt are good for your skin, and sea salt fits my beachy theme. Himalayan Pink Salt is an unrefined and unprocessed raw salt mined by hand from salt caves that formed in ancient time as ocean salt settled into geologic pockets. Because the minerals in pink salt are balanced from being in their natural state, I've read that it doesn't contribute towards heart disease, and is a healthier option for seasoning your food as compared to regular table salt. I would consider my soaps to be natural or mostly natural. I use essential oils, fragrance oils, or a combination of both to scent my soaps. Fragrance oils are not all natural. 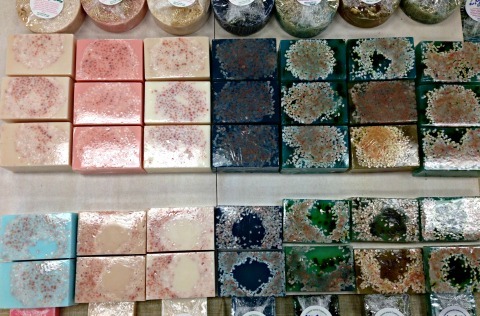 I color the soaps with mica, a natural mineral used for eye shadows. Mica comes in all kinds of colors, some of the colors are shiny and glittery. My soaps have a nice lather, but because I don't add the chemical sodium lauryl sulfate as a lathering agent to my soaps like commercially made soaps do, it helps to lather the soap in body hair. If you want to lather up while washing your hands, rub the soap on your arms and it will lather up nicely! Glycerin soaps tend to have less lather than white soaps, read more about glycerine below. Lye is what makes soap ..... soap! But, did you know that there is no lye left in the soap during the soap-making process? The reaction between lye and oils plus water is what makes soap. Lye is the compound sodium hydroxide, which basically comes from ashes ...... who'd a thunk that fats and ashes would get you clean! I get asked all the time what is the difference between commercial and homemade soaps ..... the difference is glycerin. Glycerin is a type sugar alcohol that is a humectant, it draws moisture out of the air and makes the soap more moisturizing. It is a both a byproduct of soap and is also added into soap. Sorbitol and Sorbitan Oleate are byproducts of glycerin. 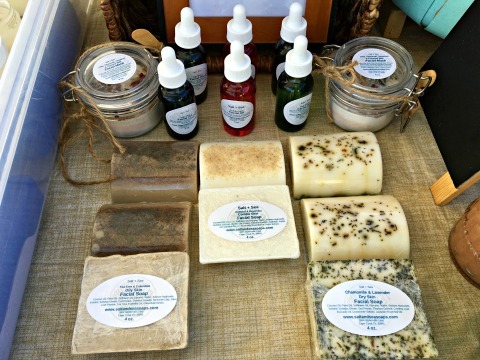 Have you noticed that commercial soaps are drier and harder, and dry your skin more than homemade soaps? They remove the glycerin to reserve it for more expensive soaps and allow them to package their soap in paper. That's why I package my soaps in plastic, it keeps the glycerin from sweating out and drying out the soap. You can still smell the wonderful scents through the plastic! 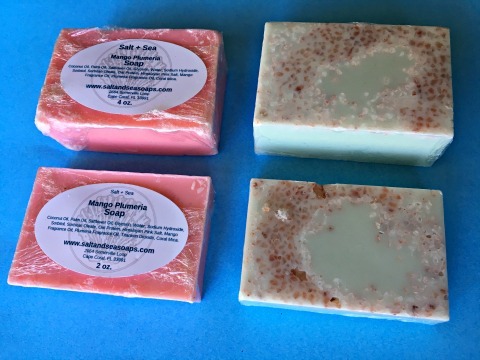 I feature the kind of scents in my soaps that you would find in Florida: citrus, tropical fruits and florals, and breeze scents. 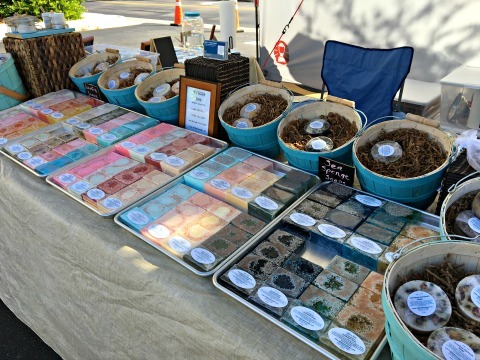 Some of my soaps feature additives such as seaweed, coconut, charcoal, dried flowers, loofah, or sea sponges. Seaweed is very nourishing for your skin, I have soap with nori or spirulina seaweed. Coconut makes a nice soft scrub on the skin ....... you hear everywhere these days how good coconut is for skin and hair care as well as for consuming. Scroll down to read about the many benefits of coconut oil and the other ingredients I use for my products. Charcoal is good for detoxifying your skin ....... it won't stain your skin, sink, or shower. Loofah is actually a plant that grows in Florida, I put an entire slice of loofah in my loofah soaps. Loofah soap is perfect for scrubbing your feet, or for those who don't mind a hard and scratchy body scrubber. I would also suggest that you not exfoliate with loofah everyday, give your skin a break. Exfoliate every 2-3 days. As you use your loofah soap, it will soften enough to use from neck to toe. 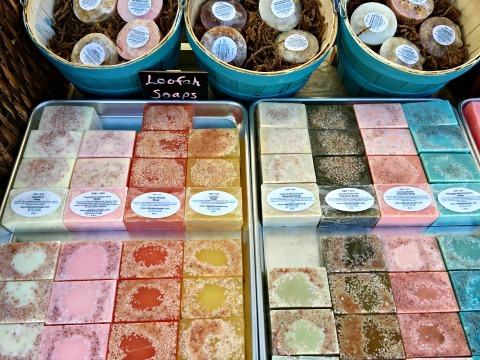 Sea sponge soaps have a softer scrub and are a better choice for those who think that loofah is too scratchy. There is an entire slice of sea sponge in each of my sea sponge soaps. 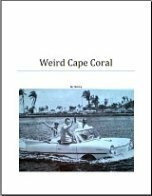 Back in the day, Tarpon Springs, a town north of Tampa, had a thriving sea sponge trade. It's fun to visit there, because many of the divers diving for the sponges were from Greece, and there are still Greek restaurants, stores, and neighborhoods in Tarpon Springs. Loofah and sea sponges are natural materials and are therefore not predictably uniform from soap to soap. Both the loofah and sea sponge help to keep the tiniest bit of soap usable to the very end. But, because sea sponge is denser than loofah, you'll need to get it wet, then squeeze it several times to get the lather going. Throw out the loofah or sea sponge when you're done with them as they may harbor bacteria from your skin and no longer have the benefit of the very alkaline PH of the soap to keep them germ-free. As for my regular soaps, I've used a piece of my soap the size of my pinky nail, and it still lathers up nicely. Try these citrus scents: Grapefruit, Orange Mango, Lemon, Lime in the Coconut with spirulina seaweed, Coconut in the Lime with coconut. Try these tropical floral scents: Mango Plumeria, Sandalwood Vanilla Orange, Passionfruit Rose, Pineapple Mint Gardenia, Champagne Jasmine, Lavender Plumeria, Honeysuckle Lime. Try these tropical scents: Sandalwood Vanilla Plumeria with activated charcoal, Coconut Bellini, Coconut with coconut,Ginger Tea and Lemon. 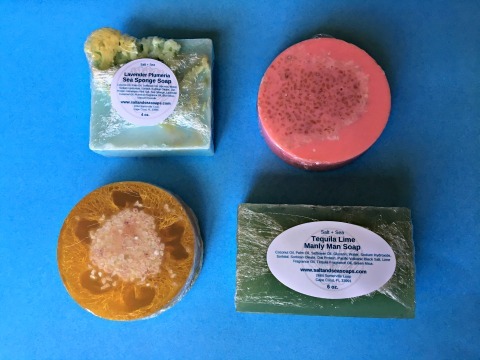 Try these breeze scents: Ocean Breeze with Tea Tree and activated charcoal; Sea Breeze with a hint of mint, Citrus Breeze, and Gulf Breeze with mint and eucalyptus ....... the last 3 soaps have nori seaweed in them. My favorite soaps are: Passionfruit Rose, Ginger Tea and Lemon, and Sea Breeze! I like the sea sponge soap for use in the shower, loofah for my feet, large soap for my bathroom sink, and small soap at my kitchen sink. Shampoo Soaps with a Coconut Lemongrass scent and added Argan, Castor and Black Seed Oils. Clay Soaps for Shaving ...... or not! You can use them for regular washing as well, the clay is detoxifying and makes a nice, tight moisturizing lather. These soaps work for both men and women. Clay helps with the slip and glide of the razor, and extra glycerin moisturizes. I feather several scents and kinds of clay. 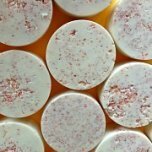 Manly Man Soaps in a chunky 6 oz size in various scents and with black salt tops. Facial Soaps made with essential oils and botanical extracts. African Black Soap with Frankincense and Myrrh. Gentle Breeze Soap with essential oils, botanical extracts, charcoal, and seaweed powder. 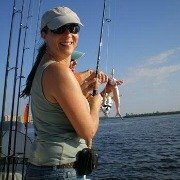 Keep checking back as I'm always experimenting and adding new scents and products ..... they make great gifts year round and especially for Christmas .... think stocking-stuffers and sending a bit of Florida back north! I also feature Soaps of the Month, with scents either relating to holidays or to tropical drinks, coffee, or whatever I'm in the mood to make. I also usually have a selection of soaps and certain products on sale .... they're either scent experiments, or merchandise I want to move or close out. How can a few simple ingredients make your skin so soft without a moisturizer? Well, my salt scrubs can! I have several scents: Mango Plumeria, Sandalwood Vanilla Orange, Passionfruit Rose, Pineapple Gardenia, Champagne Jasmine, Lime Coconut, Citrus Breeze, and Ocean Breeze. Scrubs are made with Himalayan Pink Salt, Dead Sea Salt, Epsom Salt, Coconut Oil, and Fragrance. The salts have different sizes of coarseness and together they combine into a soothing blend that feels great on your skin! 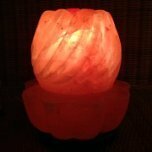 Did you know that Himalayan Pink Salt has more than 84 minerals? And, Dead Sea Salts have more than 21 minerals, including mineral combinations that aren't found elsewhere on the earth? And lastly, that Epsom Salts are full of magnesium which is great for sore muscles? My salt blend is can be used as for a tub soak as well as for the shower or sink. They are all-natural or mostly natural, it depends on if I scent them with essential oils, fragrance oils, or both. Don't worry, if you see any dark or black flecks, they are part of the natural salt. The shelf life of the scrub is 6-12 months, depending on how much water gets into the scrub as you use it. Water is what brings in germs, but coconut oil does have germ-fighting qualities. I could use preservatives but I prefer not to add in preservatives because they have parabens in them. Parabens are plant estrogens and there are conflicting studies as to whether they can be implicated in breast cancer even though they have a weak estrogenic effect. For individual orders, just let me know if you want me to add a preservative to your salt scrub or body butter. You'll love using my salt scrubs, they're perfect for scrubbing dry spots like hands, feet, and elbows ....... or even chest to toes. Smells like the tropics! I like using the salt scrub on my legs ..... they feel so silky smooth after shaving. Be aware that if you use salt scrub on your feet in the shower, you might get the shower floor oily and therefore slippery. I use a loofah or sea sponge soap to quickly scrub away the oil ....... it's so convenient and very effective! An interesting property of coconut oil is that it changes from solid to liquid when the temperature goes higher than 76 degrees. In the summer, if you keep your A/C higher than 76 degrees your scrub will be more liquid. For lower A/C temperatures in the summer and winter up north, your scrub will be more solid. I recommend scooping out some of your scrub and putting it in a soap dish or small bowl near your sink or in the shower. This takes care of the problem of the scrub going bad from introducing water into the whole container and also from the coconut oil getting too hard. To make your scrub more liquid, pop it in the microwave in 10 second bursts ....... the plastic container will melt if you overheat it. To make your scrub more solid, pop it in the fridge. These rules also apply to my next product, body butter. It has coconut oil in it too and can get softer or harder depending on the temperature. 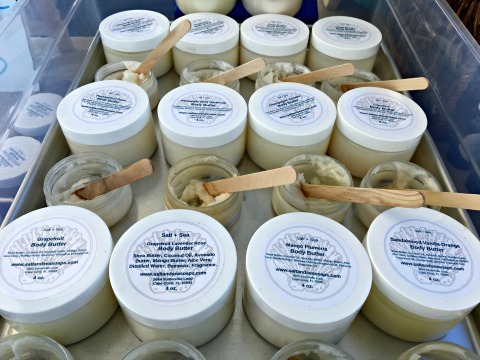 Body Butters are made with: Coconut Oil; Avocado, Mango and Shea Butters; Aloe Vera, Beeswax, Distilled Water, and Fragrance. They may start out with a bit of a greasy feeling when you first rub them on, but very quickly, they melt and absorb into your skin for a velvety softness that feels great! The shelf life of my body butter is 6 - 12 months. Although coconut oil and shea butter have a shelf life of 18 - 24 months, mango and avocado butters have a shelf life of 12 months. Water in a product will shorten its shelf life and I do use distilled water in my body butters, that's why I suggest a 6-12 months shelf life for them. You'll also want to keep it away from extremes in heat and cold. Either extreme can cause the butter to get grainy. The butter is still okay to use and the graininess will melt and smooth out as you rub the butter into your skin. However, if your butter has been exposed to heat for a long time, that may shorten its shelf life. I wanted the butter to be as natural as possible and not add preservatives. My favorite is the Passionfruit Rose, I use it neck to toes everyday, twice a day on hands and feet. Try these scents: Mango Plumeria, Sandalwood Vanilla Orange, Passionfruit Rose, Pineapple Gardenia, Champagne Jasmine, Lime in the Coconut, Citrus Sea Breeze, and Ocean Breeze. So, what are the benefits of the ingredients I've used in my body butters? Coconut Oil is so amazing! It's full of Vitamin E which has anti-oxidant and anti-aging properties. The lauric acid in coconut oil acts as a preservative and increases the its shelf life. coconut oil is moisturizing, strengthens the skin against cellulite, fades stretch marks, helps to heal and even prevent microbial and fungal skin infections such as acne and cracked heels, and eliminates keratosis pilaris ........ a skin condition with bumps on the skin from inflamed hair follicles. Coconut oil acts as a low-grade sunscreen by offering natural protection from UV radiation. Avocado Butter is so healthy for your skin, particularly dry skin. It softens and moisturizes dry, rough, chapped, and cracked skin. Avocado butter is rich in Vitamins E and A, amino acids, and plant sterols ...... substances that build collagen. Collagen is what gives your skin elasticity, it can be damaged by sun, pollution, bad health choices, and aging so you'll want to apply it regularly to keep your skin more youthful. Collagen moisturizes, firms skin, improves skin tone, reduces and eliminates fine lines and wrinkles. Mango Butter works well for all skin types and is full of Vitamins, E, A, and C. It's very emollient and moisturizing, has anti-oxidant, healing, and regenerative properties ..... you can use it for healing wounds. It offers low-grade sun protection. Shea Butter is one of the better butters for dry skin as it is highly nourishing and moisturizing. It is rich in Vitamin A ........ shea butter improves acne, eczema, dermatitis, and reduces wrinkles. It also soothes insect bites, sunburn, and even frostbite. Although Shea Butter comes from Africa and not Florida, I had to add it to my butters for its deeply emollient qualities! Oils/Butters - Safflower oil, Coconut Oil, Jojoba Oil, Shea Butter, Almond Oil, Aloe Vera, Rose Hip Seed Oil, Vitamin E Oil. Essential oils - Frankincense, Lavender, Chamomile, Rosemary, Helichrysum, Cedarwood. Extracts - Chamomile, Calendula, and Seaberry (also called Sea Buckthorn). As you can see, my soaps, butters, masks, and oils have these healing and nourishing ingredients! For the future, I'm thinking of developing products specifically for eczema and psoriasis. *Caution - Some of my body butters have citrus scents in them. Citrus scents are phototoxic, in other words they can cause sunburn by magnifying and absorbing sunlight very intensely on your skin. Don't suntan or use a tanning bed after applying butters that contain Lemon, Lime, Orange, Grapefruit, or Bergamot. Other phototoxic esseantial oils are Tangerine, Mandarin, Cinnamon (Cassia), Verbena, and Angelica. My natural facial masks are made with layers of clay, coconut milk powder, seaweed, and charcoal ....... all so good for your skin! These ingredients are very cleansing and detoxifying: clay and activated charcoal pull toxins out of your skin, seaweed has anti-aging qualities, and coconut milk powder moisturizes and repairs skin damage. Clay has some amazing properties! When mixed with water, clay becomes negatively charged - which is a good thing - and allows it to attract to and draw out impurities and toxins in and on the skin which are positively charged. It can stimulate the lymphatic system and can even draw out heavy metals, radiation, and chemotherapy through the pores of the skin when used regularly in therapeutic baths. The green clay is Bentonite. It's good for oily skin, tightens skin, clears acne, and helps with cellulite. The blue clay is Russian Cambrian clay and has the same properties as the Bentonite clay. The white clay is Kaolin. It's good for dry and sensitive skin. It will absorb some oil and mildly exfoliates. The rose or purple clays are a type of Kaolin clay and have similar properties to the Kaolin clay. Activated charcoal is regular charcoal with added oxygen and can absorb 100-200 times its weight in impurities. Medically, activated charcoal is used for nausea, GI tract infections, and poisoning. For skincare, it will deep clean and super-absorb toxins in and on your skin. To finish off my facial masks, I add some Vitamin E Oil and Evening of Primrose Oil for extra skin-nourishing benefits ......... and decorate the top with dried rose, hibiscus, and calendula petals. To use: I suggest putting 1/2 tablespoon of the powdered mask in a bowl, add a little water at a time - I start with a teaspoon of water - and mix into a smooth and spreadable paste. Put on your face for 15-20 minutes, then rinse off. It's best not to leave the mask on longer so the mask won't pull out good oils from your skin. 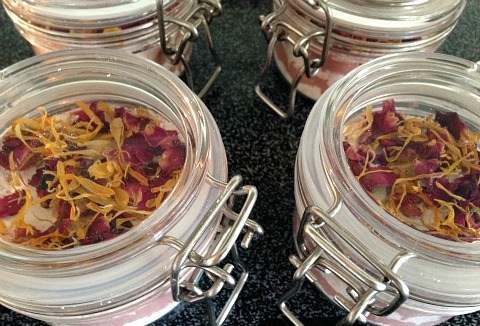 Here's a good idea: scoop the dried flowers off the top and use them with some of the clay for a detox soak in the tub. If you like salt scrubs for your body, you might want to try a salt scrub for your face. Fresh Breeze - 2 Kinds - One is made with Himalayan Pink Salt and the other with Pacific Volcanic Black Salt. The black salt actually has charcoal in it, it won't stain your skin. I've mixed Fractionated Coconut, Jojoba, and Safflower oils with Lavender and Tea Tree Essential Oils; and Dulse Extract. Gentle Breeze - 2 Kinds - The other 2 scrubs are part of my Gentle Breeze line of products made with Essential Oils and Botanical Extracts. They both have Dead Sea Salt in them ...... with one in Aloe Vera Juice, and the other in my coconut oil soap base with added charcoal and seaweed. Fractionated Coconut Oil has been processed in such a way that it remains liquid even below 76 degrees. It will not cause your skin to break out like regular coconut oil can. Back in 2015, I had a problem with Rosacea ........ it was looking pretty nasty across my nose and cheeks with rough, red, bumpy and peeling skin. I tried everything and nothing worked until I tried Oil Cleansing, which cleared my skin up beautifully! Because of that, I've developed my own Facial Oils, 1 for dry skin and 1 for oily skin. With Oil Cleansing, you use the same oil for washing your face, moisturizing it, and for removing your makeup. Massage a bit of oil directly on your dry face for 1 minute using upward circular motions. Ideally your face shouldn't be wet, however, I oil cleanse my face while I'm in the shower and it's usually wet. I just massage the oil onto my wet face. Or, you can oil cleanse your face first thing, before you get your face wet. Steam your face for 1 minute with a warm, wet washcloth. Gently massage your face with washcloth for about 10 seconds. Lightly pat dry till slightly damp, you don't need astringent or to rinse with cold water. Apply more oil to your face to moisturize .... done! After you're done, your skin might start out feeling oily, but the oiliness goes away. I have bangs, so I only Oil Cleanse my forehead when I'm in the shower and washing my hair and I have the chance for the oil to absorb before my hair is brushed and dried. How does it work? Chemistry says: "Like dissolves like" , so, oil dissolves oil. Natural and beneficial oils that are similar to your skin's oils along with healing, nourishing, and protecting botanicals can cleanse and balance it. Massaging gentle oils into your skin can dissolve the hardened and dirty oil/sebum that is stuck in your pores. The steam opens the pores allowing the dirty oil to be removed. Putting the same natural oil over damp skin gives your skin the moisture and lubrication it needs so it won't over-compensate oil production later. It is possible to clear up acne, pimples, dry skin and other skin problems with oil cleansing. Dry Skin Facial Oil - Olive, Avocado, and Castor Oils; Carrot Seed, Seaberry, and chamomile Extracts, Evening of Primrose Oil. Oily Skin Facial Oil - Olive, Castor, and Fractionated Coconut Oil; Calendula, Aloe, and Cucumber Extracts, Tea Tree Oil. Combo Skin Facial Oil - Olive, Jojoba, and Castor Oils; Oatmeal, Dulse (a seaweed), and Green Tea Extracts; Rosemary Essential Oil. Oil Cleanse 2 times a day. You might break-out for a week or 2 as your skin detoxes. This is normal, it should clear up within another week or 2. Once your skin is balanced, you can play around and see if you need to oil cleanse only once a day, or if you can get away without putting oil on afterwards at night, or for your morning cleansing, just splash water on your face, pat dry, and go. I started out using the Dry Skin formula for my Rosacea but have since switched to the Oily Skin formula when I started breaking out again. I'm happy to report that my skin has cleared up again. I also used facial masks once a week ...... I still use these products and am happy to report that my skin looks great as long as continue with the facial oil and mask! If you don't want to try Oil Cleansing, I do have Facial Soaps for: Dry and Oily skin, and an unscented oatmeal soap for sensitive skin. Dry Skin Facial Bar - Coconut Oil Soap Base (see above) + Avocado Oil, Lavender Essential Oil, Chamomile Extract, and Comfrey Leaf. Oily Skin Facial Bar - Coconut Oil Soap Base (see above) + Tea Tree Essential Oil, Calendula Extract, Bentonite Clay, and Olive Leaf Powder. Combo Skin Facial Bar - Coconut Oil Soap Base (see above) + Jojoba Oil, Rosemary Essential Oil; Oatmeal and Dulse Extracts; and Oatmeal. If you can't decide which formula is best for your skin, you would still get benefits from any of the formulas, the ingredients in each are, for the most part, beneficial to any skin type. Endless Summer Facial Serum - Coconut, Jojoba, Pomegranate Seed, Rosehip, and Vitamin E Oils; Geranium, Lavender, and Frankincense Essential Oils. Use 5 drops as a moisturizer on face, neck, and chest once or twice a day after cleansing. Disclaimer - I haven't had any training in skin care, but have done extensive research. I've tested and used my products on myself with good results. I hope you'll have good results too! 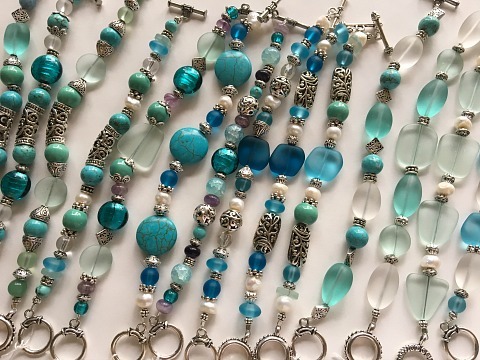 I'm now making and selling beach glass jewelry at the both Cape Coral Farmers Markets during season from October - May. 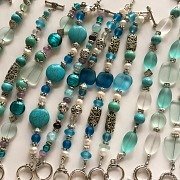 Check out my Aquamarina Jewelry page!